As network infrastructure and threats continue to evolve, so too must the threat management security solutions to protect organizations. Your business needs a high-quality, scalable application testing solution that offers threat management, as well as both manual and automated testing approaches while being cost effective. Threat Vigil is one of the leading threat management solutions that offers an on-demand, cloud based, penetration testing platform, developed by Happiest Minds Technologies for various enterprise segments. With Threat Vigil in place, IT has a threat management solution in place that protects vital information from new and vicious cyber-attacks. We understand that high-priced consulting and software solutions are not necessary for SMBs but they still need the assurance of secure applications and networks. Apart from affordable pricing, we offer unlimited testing of our sophisticated threat management solution for a year, which guarantees false positive elimination and business logic testing. 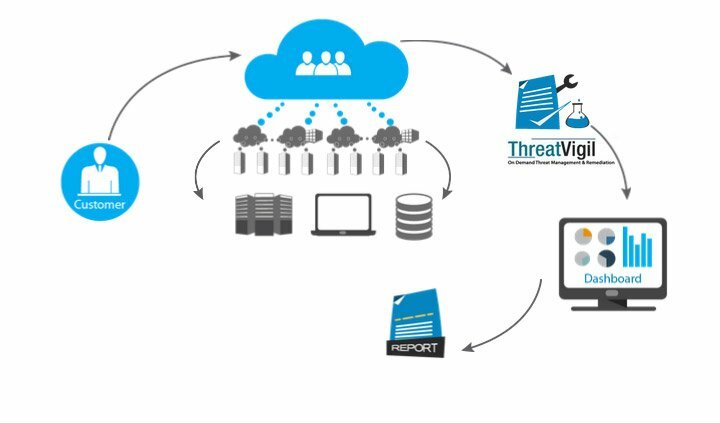 Our ThreatVigil also helps you cover the entire gamut of compliance requirements by ensuring business-critical information is secure and safe from threats. Penetration Testing is the primary method for organizations to validate that its system does not have vulnerabilities that could expose it to potential attacks. This kind of testing solution identifies vulnerabilities in a system and proactively fixes them before attacks can be carried out. While there are a number of inexpensive, readily-available automated tools for penetration testing, these usually lack quality in threat management capabilities and set off a high number of false positives while missing business logic vulnerabilities. Further, security consultants are expensive and organizations will still need to buy the actual solution afterwards. Application Penetration testing is executed using a blend of automated and manual technical security assessment approach to identify all the common vulnerabilities indicated by OWASP (Open Web Application Security Project) standard and all the other leading industry frameworks. The application security assessment service offering covers web applications, web services and thick client applications. Web application security vulnerabilities are identified with automated tools and scripts along with manual assessment to eliminate false positives and negatives. From application profiling to the remediation approach, a detailed step by step approach is followed that tackles all application vulnerabilities. Mobile native application penetration testing is executed using a blend of automated and manual technical security assessment approach to identify all the common vulnerabilities indicated by OWASP standard and all other leading industry frameworks. The mobile native application security assessment service offering covers installable applications on various mobile platforms such as Android, iOS, Windows and BlackBerry.